Unique revolving slate bed design. Available in 6ft or 7ft size. Drop pockets in British or American spec. Use as a pool table or a diner. Free delivery, installation and accessories. Most pool dining tables are converted using a top, which is laid over the table to create a flat surface for dining. The drawback of this is that the top must be stored somewhere when not in use - and that's a large piece of wood to hide. It's also usually a two-person job to safely lift, move and stow a large table top. The VIP solves these problems with a rotating slate bed, with a fully-equipped pool table on one side and a flat, finished surface on the other for dining. Simply unlock the top and effortlessly flip it over, before locking it securely back into place again. This can be easily done by one person and there's no heavy lifting involved. The slate bed provides the best accuracy and consistent play, and has been precision-cut at between 19-25mm in depth (depending on table size). The table, built around an oak skeleton, features pockets that can be made to British or American spec, as well as a quality cloth. The tables are fitted with Eurospeed cloth as standard, with four colours to choose from, or you can specify Simonis 860 or 760 cloth for a small surcharge. TBS rubber cushions provide a lively rebound. Two sizes, two specs and four finishes to choose from. Order yours in 6ft or 7ft size to suit your space, in your choice of four finishes. You can also specify whether you'd like a British-spec table, with UK-spec pockets and L-shape rubbers, or an American-spec table, with wider pockets and pointed rubbers. There's also an optional remote control rotation mechanism. Delivery, installation, levelling and accessories are included. Flip from pool table to dining table with ease. Choose 6ft or 7ft table size. Choose British or American specification. 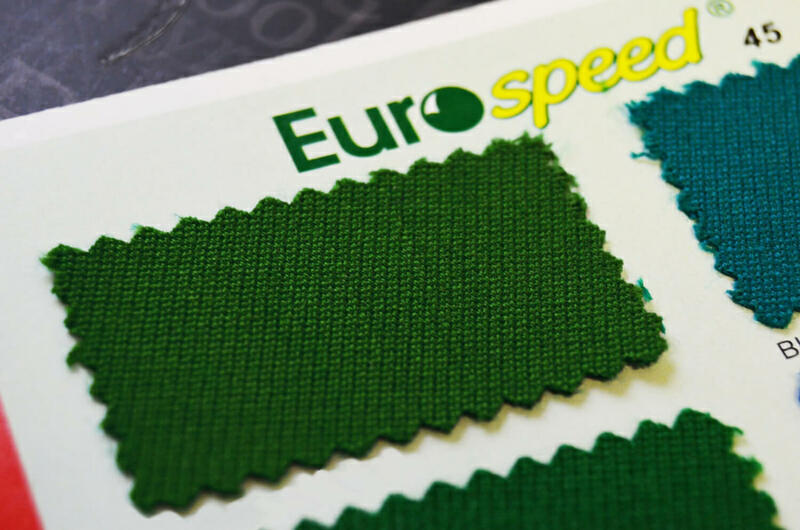 Eurospeed cloth fitted as standard, or upgrade to Simonis. Optional remote control automated rotation mechanism available. Cloth colours are for guidance only. Please call for more details on different cloth options. Eurospeed is fitted to the VIP as standard, and is included in the price. This is a great value cloth that can be fitted in four standard colours. Simonis 760 is an optional upgrade to the VIP. It is a nap-free speed cloth with a high ball speed, ideal for intense games. It comes in 15 colours. Simonis 860 is an alternative upgrade, and is slightly slower than the 760. Nap-free and designed to be durable, wear-resistant and versatile, it comes in 28 colours.